Japan on Burnet Road. 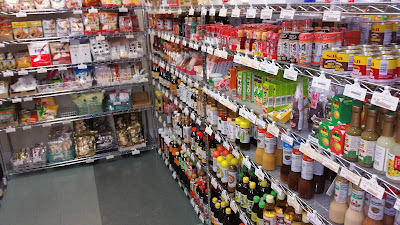 ASAHI is a wonderful small grocery of Japanese goods. I am neither physically nor psychologically housebound. I'm not in any grand way agoraphobic or OCD. If I'm in denial, that denial didn't keep me from going out of the house this morning on a mission to get some matcha tea. For the uninitiated, Google, via Wikipedia, says matcha tea "is finely ground powder of specially grown and processed green tea. It is special in two aspects of farming and processing: The green tea plants for matcha are shade-grown for about three weeks before harvest, and the stems and veins are removed in processing." I want matcha both to drink and to add to my smoothies, and while that's a little tricky because matcha comes in grades, some of which are more strongly flavored for cooking, and some are milder but of highest quality for drinking in a tea ceremony, there is an intermediate grade that, more or less, serves both purposes. Every part of the world has its bad season. In the north winter is hard, though I know there are people who love the cold and the beauty of a landscape intensely brightened but ambiguous with snow. Most places in the tropics have rainy seasons, but those never bothered me that much—I'm an indoor person who loves a warm dry place to read and sip tea while the rain pours outside, and I particularly love punctuation of emphatic lightning and thunder. In Texas winter doesn't amount to much and features scattered perfect days; fall and spring are idyllic; but in summer they open the door of a thermonuclear blast furnace and throw oceans of water upon the hot coals of hell until it feels like Chernobyl boiling over out there. Rolling myself in thick woolen blankets freshly drawn from boiling water simulate the experience, so there's no way to romanticize it the way I can romanticize winter as if it were a scene in a David Lean movie in which Yuri marches across endless landscapes of snow back to Yuriatin. I cannot compare a Texas summer day to a rainy spell in which the only thing to do is read. Since I work at home, it's too easy in this season not to go outside, and the whole effect multiplies like a sedentary snowball that gains mass but rolls nowhere. 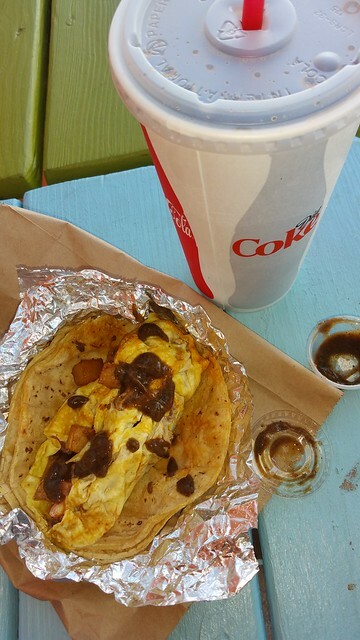 Charlie's breakfast taco at El Chilito. I tried before, with mixed results, to get myself out into the world by switching games from Blizzard's World of Warcraft to Niantic's Ingress. That was back when I was still playing Warcraft—now there is no time to play. So I think maybe a new game from Niantic, Pokémon Go, might get me out there, but it's hard to work up the enthusiasm for a game that traffics in anime characters two generations younger than I. I add a breakfast taco, via a small detour, as further incentive to get me out the door. It works. El Chilito is at just the right distance—when I get there, I have covered some ground but not so much that my patience bristles. I want a fairly standard breakfast taco—eggs, chorizo, potatoes—and CHARLIE’S SPECIAL comes pretty close to that with farm eggs, chorizo, potato, tomato, onion, and serrano chili. I also like the name because it reminds me, in its flagrant Anglicanness (as opposed to the Spanish diminutive, Carlito), of Charlie Wilson's War with Tom Hanks. El Chilito's menu presents what amounts to an interesting collection of recipes, each of which can be had as a taco, a burrito, or a plate, meaning with corn or wheat tortillas and a couple of tablespoons of rice and beans on the side. Charlie's, without the war, cost $3 for the taco, $6 for the burrito, or $9 for the plate, at which point I would have a bit of sticker shock. Fortunately I am not here to satisfy a big appetite but just for a taste of a breakfast taco. This is my third time at El Chilito, and this is the most successful trip. Their recipes seem anxious to flaunt their authenticity with excessive cumin, and this space race to authentic plebeian Mexico has accelerated ever since the local Mexican restaurants abandoned the old standard Tex-Mex recipes, but fortunately they moderate the cumin in a breakfast taco—it's there but in manageable trace quantities. I don't want to digress too much into Mexican food—we have visited this topic before—but in a nutshell, a Tex-Mex taco, for example, resembles a Taco Bell taco, which is very much still around, except that it is slightly bigger, beefier, cheesier, overall heartier, and usually served with a fresher, chunkier, spicier hot sauce. The new Mexican food has fractured into a million splinter groups the way Yugoslavia shattered into a dozen warring ethnically angry sub-countries after the Soviet Union split up. Or perhaps the Protestants are a better example—having split from the Church, the Protestant groups splinter recursively and repeatedly until they are at six degrees of separation from the church they came from. I am in a particularly gregarious mood this morning, and I'm grumbling about climates to the guy who takes my order. So naturally he's asking about what other climates I've experienced—me and my big mouth!—so I tell him I've been to Korea and India and how I want to see China. He acts duly impressed, and I slip quietly out the door with my taco and root beer. 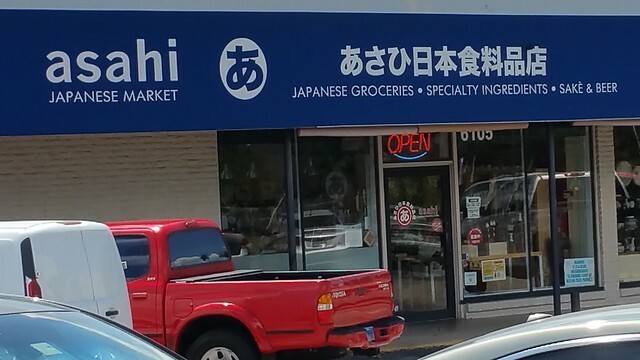 Asahi in a small strip mall on Burnet Road. Hello. I'm curious whether it would make sense (gastronomically) to add some matcha powder to a fruit smoothie. Do you think that would work? Or does it need to be steeped first? In fact, if I just want to drink the tea made from matcha, then can I just add it to hot water? Or perhaps perform my own little abbreviated tea ceremony? Mixing matcha powder into smoothies is actually a very popular thing to do, and it turns out delicious! All you need to do is mix about a teaspoon of matcha powder in with your other smoothie ingredients, no need for steeping. You can also add more matcha if you want the green tea taste to be stronger. We also sell matcha specifically to use for flavoring food and drinks called "culinary grade matcha" as well as Matcha Boosters, which are packets of culinary grade matcha powder that also comes sweetened and flavored. To answer your next question, making matcha with just hot water is very doable. To do so, you just want to mix your powder with a little bit of hot water first in order to make it into a paste, then add more hot water (six ounces of hot water to one tablespoon of matcha is a good measurement) then stir again to distribute. You can always add more matcha or water for taste, as well. Hope you can make it by our store to browse our selection. Thanks again for your question! This individual attention pays off because in retrospect I can see how it creates an impulse to get me to Asahi so I can act on the information they are kind enough to give me. 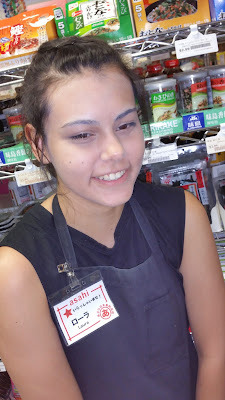 Once I get to the store, Laura, who is safely esconced at a computer behind the counter, readily comes out to show me where the matcha powder is and to explain the different grades. 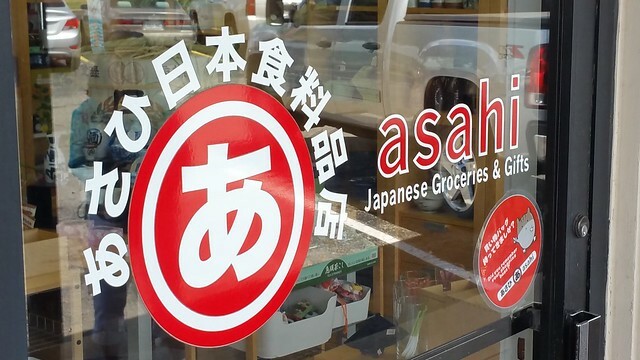 I am impressed because this isn't the first time I've sought help from the good people who work at Asahi, and they have always shown a great deal of knowledge about the many products on the shelves. At some point I reveal my assumption that Laura is at least partly of Asian descent, so she corrects me and says that she is Hispanic. My gregariousness is still in full swing, though, and I do not remember exactly what I say then. I hope I didn't say something stupid like, Oh, that's OK! I should have apologized for my assumptions, and praised her expertise in the products. I have always assumed that the people who work here know all the details about all these products because the cuisine is a part of their heritage, but that's not the case with Laura, so that makes her expertise all the more impressive because she's learned it all as part of her job. In addition to the matcha, I buy a rice ball, some Pocky sticks, and a single mochi covered matcha ice cream. I have just learned about rice balls from the videos of some YouTuber in Japan. At first glimpse a rice ball looks like a giant piece of sushi, but no, it is simply a large ball of sticky rice with something in the center—I got one with bonito at its heart (bonito is a cousin of tuna and tastes similar). 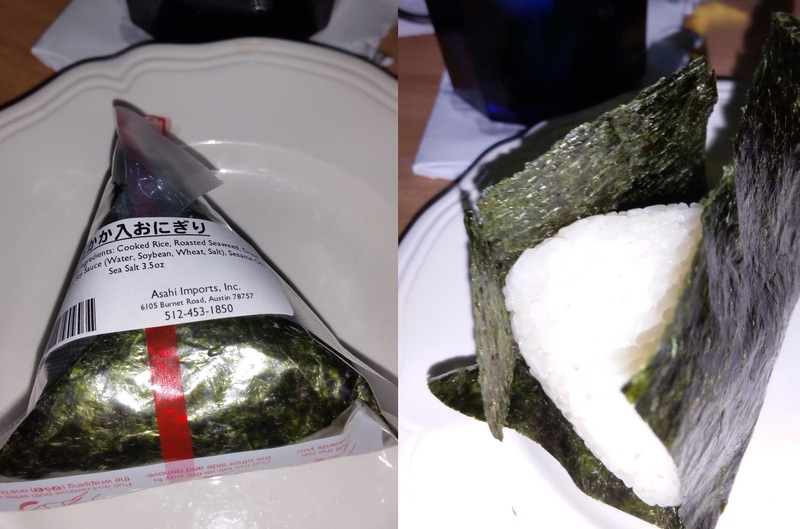 The rice ball in its packaging (left), and sitting in its nori ready for eating. The fish ball is wrapped with some of that Japanese ingenuity for packaging: the package is wrapped with a double sheet of cellophane that's opened by pulling on a red ribbon. After I pull the ribbon all the way around, the rice ball falls out onto my plate, and the double sheet of cellophane, I suddenly understand, serves as an envelop for a large sheet of nori, the dark green roasted seaweed, like thick dark green paper, that I can use to pick up and eat the rice. Nori is probably best known as the narrow ribbon that sometimes wraps around nigiri, the sticky rice topped with a slice of super fresh fish sitting on top. The nori contributes its own subtle flavor to the rice ball that makes the whole thing work. It was a treat that I liked much better than I anticipated, but I guess I shouldn't be surprised because more than once I've made a meal of clumps of steamed rice fresh out of my rice cooker and wrapped in nori—or kim, as I learned to call it in Korea. There are many aisles tightly packed with all sorts of products. 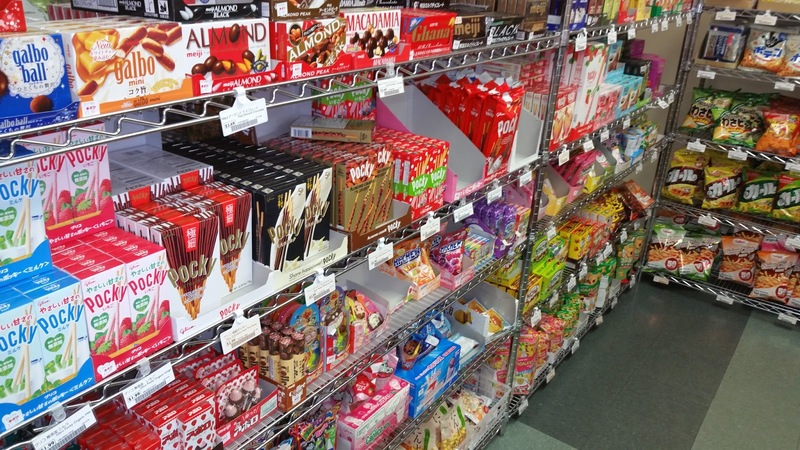 The snack section, with a huge variety of Pocky sticks on the second row. Then it was time to head back home. My cousin, who stayed overnight after watching a late movie with us, was still asleep, and so was my mom, so I had this little adventure while everyone else was yet abed. 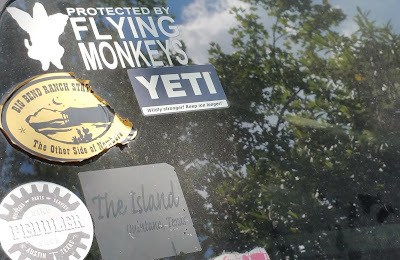 Keeping Austin weird: bumper stickers on a back window of a vehicle parked near my house.